17 items found searching fields for 'recipe scaling' on 2 pages. Use controls at the page bottom or Alt-P (prior page) or Alt-N (next page) for more items. 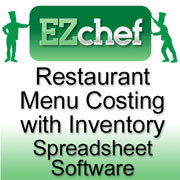 EZChefSOFTWARE� Inventory Management, Menu Costing and Analysis for Restaurants & Bars is a full-featured Microsoft Excel-based spreadsheet application that is powerful, intuitive and easy to use with an optional "one click" feature that imports all Sysco food products, with current prices, directly from a customers order... more. 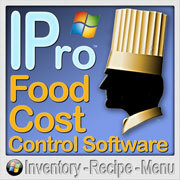 IPro restaurant and general food service inventory and recipe cost control software dramatically reduces food and beverage costs by detecting creeping costs, overuse, theft and unknown costs. IPro features periodic and perpetual inventory for food, liquor and supplies, build-to-par ordering, purchase history, vendor comparison, recipe co... more. 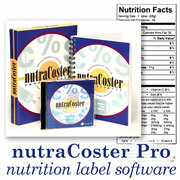 nutraCoster is a powerful software program for analyzing recipes for both cost and nutritional content. It is primarily used by bakeries, commercial food producers and others who need the required Nutrition Facts and Ingredient Label Panels per both US and Canada rules for their product labels, along with product foo... more. 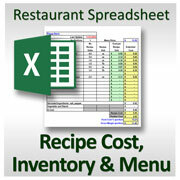 One of a series of pre-configured and customizeable Microsoft Excel spreadsheets authored by a leading restaurant accounting consultant. Designed to track your sales data from cash register or POS reports, the worksheet organizes daily and week-to-date results. Monitor sales by category and track weekly trends. D... more. One of a series of pre-configured and customizeable Microsoft Excel spreadsheets by a leading restaurant accounting consultant. Use this to organize and analyze critical data from your POS system and make sure it is not ignored. Track sales data from cash register or POS reports and organizes daily and week-to-date results. Track labo... more. One of a series of pre-configured and customizeable Microsoft Excel spreadsheets by a leading restaurant accounting consultant. Schedule every labor hour of the day to get instant feedback of the costs of your scheduling decisions. Compare labor expense with your projected sales to determine optimum employee scheduling. Create your weekl... more. One of a series of pre-configured and customizeable Microsoft Excel spreadsheets authored by a leading restaurant accounting consultant. Counting and calculating your end-of-month food and beverage inventory is made easy with this spreadsheet. Enter your restaurant's product list and unit prices in the inventory template and the form doe... more. One of a series of pre-configured and customizeable Microsoft Excel spreadsheets by a leading restaurant accounting consultant. Accruing payroll at the end of each month is unquestionably the most important task that 99% of independent restaurant operators ignore. Most importantly, use this for accurate payroll totals in your profit and... more. These Microsoft Excel workbooks were developed and designed for chefs and managers who want to create fully costed and printable weekly staffing schedules for each job category in their restaurant. Two workbooks are provided; one for the kitchen and the other for front of the house staff. Downloadable for immediat... more. One of a series of pre-configured and customizeable Microsoft Excel spreadsheets by a leading restaurant accounting consultant. Summarize your daily food and beverage purchases on a single weekly log sheet. Includes vendor name, invoice number, date and breakout by food & beverage category. Have a one page, easy to read summary of weekl... more. One of a series of pre-configured and customizeable Microsoft Excel spreadsheets by a leading restaurant accounting consultant. This spreadsheet takes the series to its logical conclusion by accounting for your weekly food and beverage purchases, beginning and ending food and beverage inventories and gross labor. Use this report to mana... more. These IPro add-on module enables direct downloading of sales data from your POS's polling program to IPro.... more.